Upper arm fractures encompassing the humeral shaft are common breaks of the human skeleton. Although fractures the clavicle (collarbone) and proximal portion of the humerus are more common, humeral shaft fractures occur in frequency and may be associated with pain and deformity. Fortunately, most fractures of the humeral shaft respond to treatment without surgery. 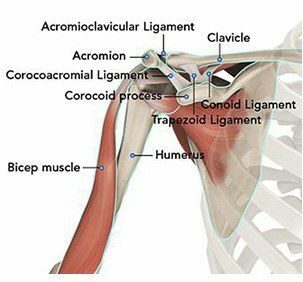 Connecting the shoulder and elbow is the humeral shaft. 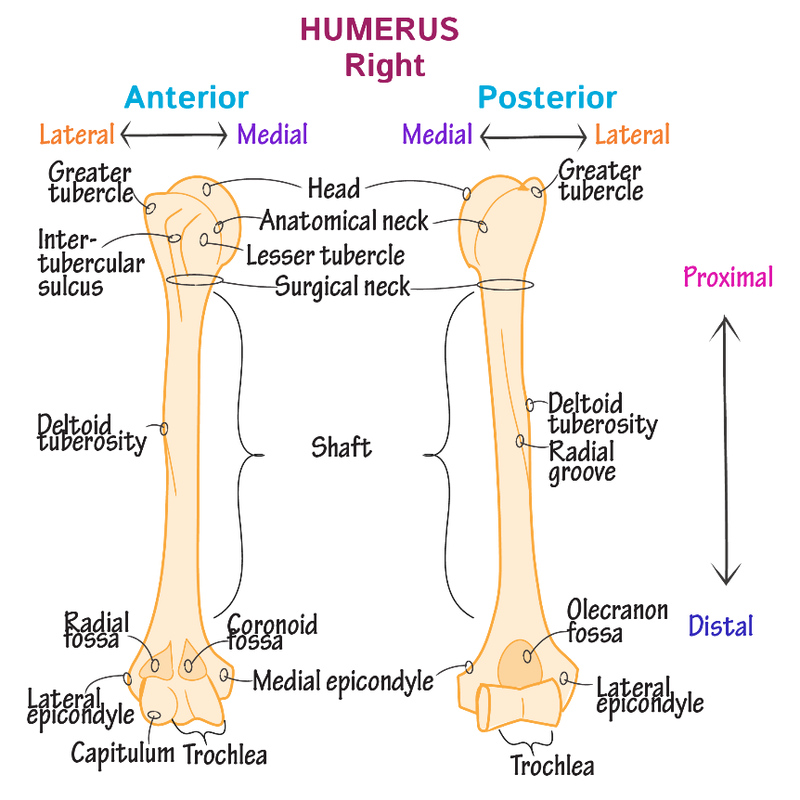 The humeral shaft is a long tubular bone, which is hallow on the inside (medullary canal). This bone is strong, especially in younger individuals, but with aging associated with bone weakening (osteoporosis) it may become less resilient and prone to fracture. A right shoulder from the front (anterior) and back (posterior). The proximal portion is the ball component of the shoulder. 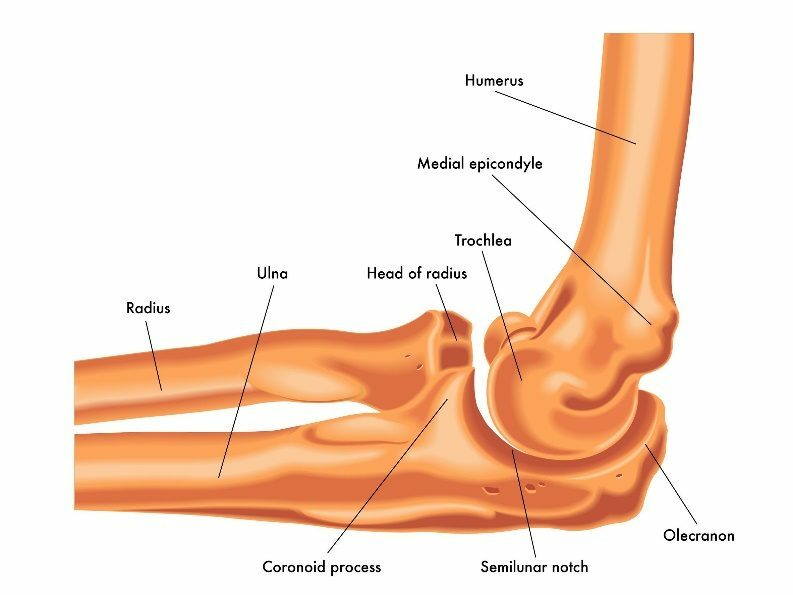 The distal component is the hinge component of the elbow. The middle section is relatively straight and the humeral canal allows placement of rods or the application of plates. Patients with fractures of the humeral shaft complain of pain, bruising, and often deformity. The weight of gravity on the arm causes increased discomfort. After reviewing the patient’s symptoms, a review of their pertinent medical history and family history is obtained. The location of the deformity is determined and a neurologic and vascular exam of the extremity completed. Patients with humeral shaft fractures may have neurological dysfunction arising from nerve bruising at the time of injury. The most common neurological injuries occur in the radial, musculocutaneous, ulnar, and median nerves. X-rays of the humeral shaft are typically utilized for evaluation. 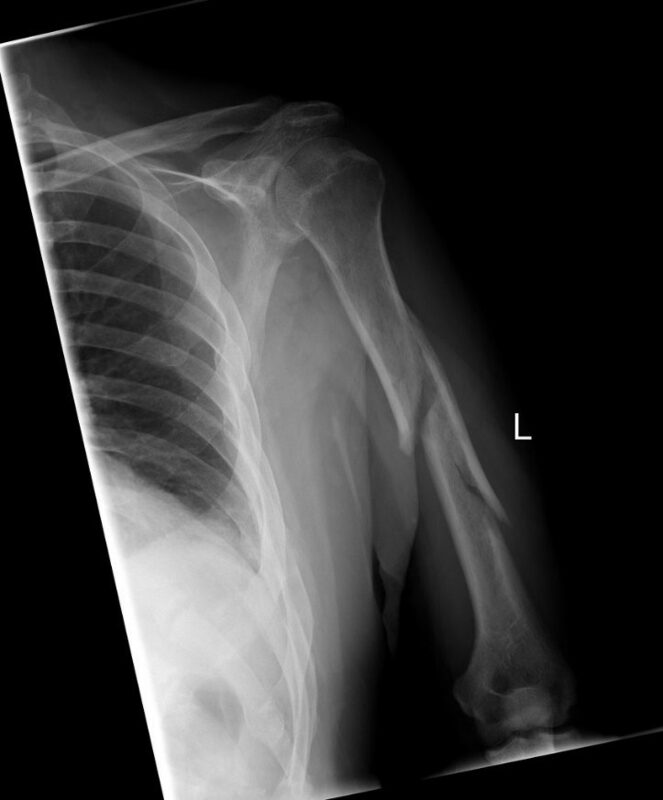 These radiographs should include the shoulder and elbow—as associated injuries to these joints may also occur. Although x-rays do not image the soft tissue of the rotator cuff, they can add information regarding the presence of arthritis, fracture or dislocation. Often x-rays may be the only study required for evaluating humeral shaft fractures. A radiograph (x-ray) of a left arm demonstrating a fracture of the shaft of the humerus. This fracture is in three pieces—meaning comminution. Further note the frontal radiograph also includes the elbow and shoulder. Complete radiographs of any fracture also include a side view (lateral) of the injury. Advanced imaging can add additional information in understanding the pattern of a fracture. CT examination is most often used as it gives better delineation of bone than MRI. MRI is utilized if suspicion of additional soft tissue is warranted. 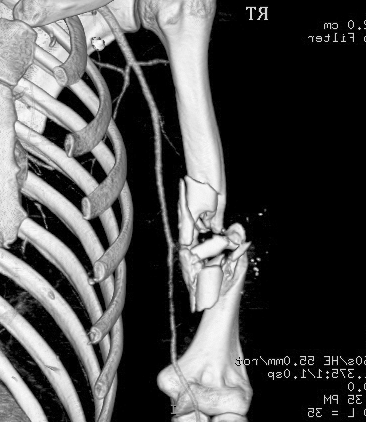 A three dimensional CT scan shows the detail of a comminuted humerus shaft fracture. As discussed in the image above, most upper arm fractures which are non-displaced or minimally displaced do not require surgery. Considerable deformity may be accepted without changes in overall function after healing. This is due to the joints both above and below the fracture (shoulder and elbow). Humeral shaft injuries are immobilized for comfort and once comfort is obtained a rehabilitation program is begun. Immobilization may require only a sling or may include bracing. Bracing often may include a plastic brace (orthoplast or Sarmiento) in addition to the sling. Patients are instructed in range of motion and progress to add work on strength. These programs can often be performed at home. Recovery and return to sport varies but ranges from 8-16 weeks. 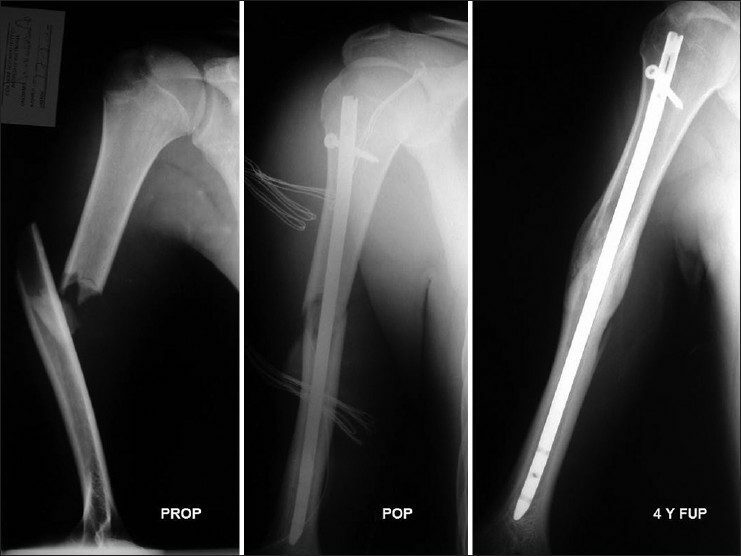 Displaced humerus shaft fractures may be candidates for surgical stabilization. The location of the injury and degree of comminution play a role in deciding the type of stabilization. In general, these fractures may be stabilized with either plates or screws or with the insertion of intramedullary rods. Figure on Right: Long term follow up of the fracture showing complete healing (union) of the fracture—note distally there are no locking screws as the rod is tight enough distally to gain rotational control without screws. Surgery is typically performed with a nerve block and supplemental anesthesia. Surgery typically requires less than two hours and the risks of blood transfusion are 1% in most studies. Selection of the type of internal fixation is based on location of fracture, comminution, and patient factors. Advantages of intramedullary nailing include smaller incisions, as the rod is typically placed under fluoroscopic (live x-ray) guidance. Not all fractures are amenable to rod fixation. Plates and screws offer the advantage of rigid fixation for fractures that are in proximity to joints (peri-articular). The need for medical prevention of deep vein clots after surgery is controversial and ranges from none, to aspirin, to mechanical compression to blood thinning agents. Other standard risks associated with surgery and arthroplasty are applicable to these types of procedures. After surgery the arm is immobilized in a sling to allow for wound healing. Patients report pain after surgery, but the pain generally improves and the utilization of multimodal pain techniques have been shown to improve outcomes for patients. Night pain is typically the most problematic—but multimodal pain programs, heat, and sleeping elevated can improve this difficulty. Many studies have shown that patients can successfully rehabilitate their shoulder on their own at home. Patients are typically guided through a therapy program and weaned from their sling over the first 2-6 weeks. Bone healing typically requires 8-12 weeks. Patients that continue to work on motion and strength show improvement for up to 1 year after surgery.